Pleasant Ridge Tour of Homes - Step Inside 9 Unique Houses in 1 Amazing Neighborhood! The Pleasant Ridge Community Council (PRCC) has just announced a tour of nine neighborhood homes to take place on Saturday, October 20, 2018 from 1-5 pm. The hand selected homes represent the beauty and diversity of the architecture in this popular community. This “walking” tour will cover approximately 2 flat miles and feature distinctly unique homes of various sizes, styles and décor, from Georgian to Tudor, stately to small, modernized and traditional. This year’s homes include a craftsman bungalow recently featured on Houzz.com, a quirky “tiny” home completely personalized by its artist owner, striking outdoor gardens, and massive home renovations completed in the last year that completely revitalized three neglected (roughly) 100-year-old houses that were on the brink of crumbling. “Pleasant Ridge is a centrally located neighborhood, known for its diversity, walkability, active community engagement, and awesome public Montessori school,” Fay explained. “It’s no wonder the neighborhood is growing and changing rapidly and is one of the hottest real estate markets in the city.” Businesses are following this housing trend, renting and developing restaurants, storefronts and offices in the business district centered at Ridge Road and Montgomery Road. 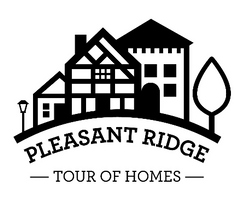 Tickets for the Pleasant Ridge Tour of Homes can be purchased in advance for $15 each at www.prtourofhomes.com or for $20 the day of the event at St. Peter’s Church (6120 Ridge Road) from 12:30 pm – 3 pm. All ticket sales will benefit the Pleasant Ridge Community Council, which funds safety, beautification and walkability projects in the neighborhood.